For many, the mundane act of tucking your child into bed at night can present as quite an ordeal. Settle them down, get them in their PJs, check the wardrobe for monsters, read a bedtime story, check for monsters again, lights out. This issue of monsters needs to be taken seriously: even with some tactically placed night-lights, and a NERF gun at the ready, sometimes darkness and the supernatural prevail and the parental bed gains an extra guest for the night. Thankfully, most of us outgrow our negative relationship with the dark, but for some children, these nights are only the beginning. Children living with Usher syndrome never escape the darkness. For them, darkness only grows with time. Nights become blacker as they lose all ability to see below certain light levels. Those night lights and NERF guns may as well be gone as objects become harder to make out. Eventually, the darkness begins to visit them during the daytime as they see their peripheral vision close in, tendrils of blackness creeping in from every angle. Thankfully, Usher syndrome is extremely rare, affecting approximately one in 10,000 people. In addition to the gradual onset of blindness, sufferers are also deaf from birth, which can immensely impact their abilities to learn and communicate. Usher syndrome is a genetic disease, which can be caused by a mutation in a gene called CDH23. There are currently no treatments or cures, which is leading researchers to explore some inventive approaches, such as gene therapy. Much like changing a flat tyre on your car, the premise of gene therapy is simple: if a gene is broken, provide the cell with a new one that works. Despite this, these days it’s clear that achieving successful gene therapy is perhaps more akin to rolling a tyre down an assault course with fire pits and swinging axes and hoping that when it gets to the car, it has the manners to hop onto the axel itself. While difficult, there are still ways to make the process of throwing genes at cells a little more elegant. For starters, targeting areas of the body that you can reach with a needle (e.g the eyes) substantially reduces the number of swinging axes our new genes come up against. Using biological tools which can stand in for qualified mechanics can also make the end switch much more possible. Enter viruses. Viruses are fascinating objects of nature. In many cases, consisting of just some genetic information and a protein coat, viruses roam the expanses that are our bodies, seeking cells that they can hijack for their own nefarious needs. Viruses enter cells and take over their machinery, convincing them to read the viral genes as if they were the cell’s own. This means that cells are tricked into producing and assembling a new generation of viruses, each ready to head off and find their own cellular fools. While viruses can be troublesome and, in some cases, deadly, the traits that make them great biological spies are exactly the traits that make them outstanding tools for gene therapy. By cleverly switching out some of the key genes for making viruses, and replacing them with, say, CDH23, we can in one quick motion remove the ability of the virus to cause harm and prime it for repairing our broken eye cells. One of the more popular viruses used today is called ‘adeno-associated virus’ or ‘AAV’. AAV is a great gene therapy virus because it’s extremely safe and can infect cells that aren’t dividing – like many of the cells in our eyes. One unfortunate drawback of AAV is that it’s so tiny. Clearly, all viruses are tiny, but AAV dwarfs many of these by a long way. AAV has a genome length of just 5,000 base pairs. This means that of all those As, Gs, Cs, and Ts that code for our genes, there are only 5,000 in a line from start to finish. To put that in perspective, that’s 25x smaller than say, the chicken pox virus genome, or 600,000x smaller than the genome of humans. Unfortunately, this means that not only can you not fit many genes inside of AAV, but some genes won’t fit at all. This includes the Usher syndrome gene, CDH23, which is 10,100 base pairs long. The scientists behind a recent study published in Cell have valiantly taken this problem on. They reason that if a gene won’t fit into a virus’s shell, then why not chop it into pieces? Imagine a family of very tall people all trying to fit into the same Mini. If there’s not enough legroom to go around, it makes much more sense to take separate cars. In the same vein, researchers took the CDH23 gene, and placed it into three separate AAV vectors. The key to making this work was finding a way to get the three gene pieces to assemble back together again once inside the cell. This involved flanking each gene piece with special ‘recombinogenic’ and ‘splicing’ sequences. The recombinogenic sequences are used for the sticking; like two Velcro pads at either end of a piece of fabric, the cell uses these sequences to assemble the gene into one. However, this leaves rough sequences in the middle of the gene, making it impossible to read. This is where the splice sites come in. These sequences tell the cell to chop out the intervening recombination parts, much like instructing someone to diligently sew together the Velcroed fabrics, leaving one uninterrupted, readable sequence. The researchers showed that when these viruses were injected into the retinas of mice with the CDH23 mutation, levels of full-length CDH23 protein were shown to increase. Unfortunately, this system cannot show whether the increase is enough to reverse any of the effects of the disease. This research hopefully provides some light at the end of the tunnel for children suffering from Usher’s. Maybe one day, AAV will be just another weapon in the fight against monsters in the dark. 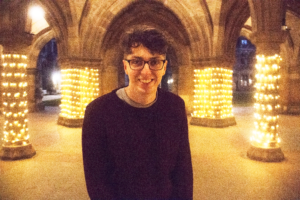 About the Author: Alex Binks (@ binknabel) is a final year PhD student at the University of Glasgow, currently completing the remainder of his studies on a secondment at Imperial College London, supervised by Prof Iain McNeish. Alex’s research revolves around oncolytic (“cancer-killing”) viruses and how the mechanisms of killing that these viruses employ can impact the immune system. Outside of the lab, Alex enjoys finding ways to engage the public with his science via articles and videos. Comments from our judge on the 2018 competition: Our judge, Jenny Rohn, was impressed with the high quality of the entries this year. After a difficult decision, the prize went to Alex Binks, a PhD student from the University of Glasgow, for his essay entitled Of Monsters and Genes: using AAV as a tool in the fight against childhood blindness. “Alex engages the reader straight away with a humorous sketch about how kids are afraid of the dark and what parents have to do to mitigate night terrors at bedtime,” Jenny says. “But then the tone shifts dramatically as he paints a haunting picture of what life is like for patients with Usher syndrome, ‘tendrils of blackness creeping in from every angle’ “. The essay was also packed full of creative and humorous analogies to aid in comprehension of the science: gene therapy was likened to changing a flat tyre – in an assault course with fire pits and swinging axes – whereas packing a segmented genome into a virus particle was like trying to get a family of very tall people into a Mini. And along with the best essays, Alex’s piece ended full circle, echoing those monsters under the bed from the beginning. Although not taking the prize, Jenny chuckled quite a bit over an essay about gingival scarring by Chris Smith, a PhD student from Barts and the London School of Medicine and Dentistry, which was penned entirely in rhyming couplets. Her favourite line? “Let’s examine the role of saliva/Strip it down like Lady Godiva”. Many thanks to everyone who entered this year.